earthware. Interactive maps for The Wine Society. The Wine Society came to us because they needed unique, interactive maps to fit in with their new responsive website. because... society members want to explore where their wines have come from in an interactive and engaging way. We put users at the heart of everything we do, so we created schematics to test the maps with real users before the full solution was developed. We then worked with the Wine Society to agree the best styles and technologies to use for their solution to ensure the maps looked great with the existing website. 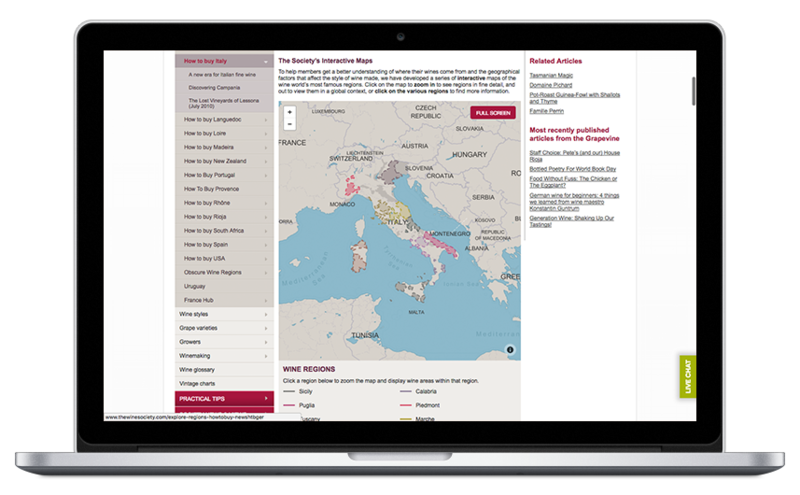 We created a country level and region level map for each of the 11 wine regions in Italy. Each map was interactive and displayed information about that region. The maps were optimised for a number of situations, including in-page, full screen, in email and in print, allowing users to explore and understand wine areas and appellations. Attentive, professional, knowledgeable. earthware are good at understanding issues and implementing effective, tailored solutions. Our collaborative work resulted in wine maps, highly welcomed by our members, and their customer service and support are second to none. Thank you!